The Blue Flower by Penelope Fitzgerald is a fictionalised story of German philosopher Friedrich von Hardenberg (2 May 1772 – 25 March 1801) and his short-lived love affair with Sophie von Kuhn (1782–1797). The two met when Hardenberg visited her house to meet her father. Hardenberg was learning to be a salt mine manager when he met Sophie who was twelve years old at the time. She was an unusual choice for him considering how most thought she was average in looks, personality and intelligence. Hardenberg was also an aspiring poet and philosopher at the time, thought she had a special quality about her. The pairing was considered unusual at the time but not wrong. He was twenty-two years old at the time, but his intentions were honourable. The pair got engaged when she was thirteen and they were to be married when she turned fifteen. I felt sorry for Sophie. In the book, she seemed very passive. I think as she grew older, she developed some affection for him but only because she grew up with him. I think Hardenberg and Sophie would not have been happy together if they did get married. In the book, all he did was say romantic and philosophical things and Sophie never understood them. She was more interested in playing with her dogs, snow and playing with her siblings, typical interests for any child. I think she had a lot more growing up to do and didn’t comprehend the responsibilities that marriage would entail. Besides the romance, the book also describes Hardenberg’s family and friends. I felt that all the characters were very fleshed out. I liked reading about Hardenberg’s family, particularly his siblings. I felt sorry to learn what happened to them in later life. I thought Fitzgerald captured every day life in the 18th century authentically. I liked descriptions of the relationships between men and women. There were times when I didn’t like the dialogue, I thought it was too philosophical and not what people would say. The Blue Flower is not something I would normally read. Jon Bear and I put it on our booklist when we first started the blog. We wanted to do a book challenge and read things we had never read before. I don’t know who picked this book. I think we chose eleven books each. I chose a selection of books off the bestseller lists and some from my own collection. 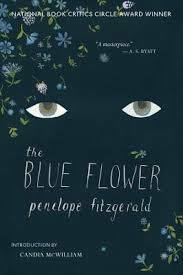 I enjoyed reading The Blue Flower. I like historical books. I thought Fitzgerald’s writing was so good that if I hadn’t known, I would have thought that the book was written in that time instead of being published in 1995.